During an active and successful exploration effort in 2018 with programs underway at many of its projects, Globex Mining Enterprises Inc. (CA: GMX – $0.30 & US: GLBXF – $0.23 & GER: G1MN – €0.19) also continued fieldwork at its Francoeur/Arntfield Mines project in Quebec. As numerous high grade gold intervals had been reported from previous campaigns, the Company shifted its efforts to target new discovery zones which had the potential to build on the resource magnitude for the project. One such target, the 450 Zone located at the southern edge of the property, yielded attractive gold values in preliminary surface stripping and channel sampling. Gold zones encountered across substantial widths during this program included assay values in the range of 7 grams per tonne. Some of the most promising channel samples were located near the southern property boundary and this suggested that additional gold-bearing structures could exist beyond the property limits. Prompted by the ongoing positive results from the 450 Zone, Globex seized the opportunity to secure ownership to adjoining claim groups further to the south and in proximity to other exploration areas of the project through a friendly transaction completed in December. This greatly expanded the property area controlled by the Company and also created a much more attractive gold target on which to potentially build resources. Globex is getting underway with the next phase of work at the expanded 450 Zone gold target. This week the Company announced it has completed 15 kms of line cutting in advance of geophysical surveys. Line cutting is the preliminary work to clear surface brush and open access for the precise deployment of survey equipment to ensure optimum coverage of the target area. A program of induced polarization (IP) has started, along with an expanded magnetic survey covering the 450 zone and some of the adjoining newly acquired claims. These geophysical surveys collect data on the characteristics of the rock below the overburden cover. Using these techniques, the interpretation of generated data has proven useful to efficiently outline and define drill targets, where the presence of structural targets has been indicated. Globex will await the results of this preliminary work prior to determining the scale of the next drill program at the project which is slated to commence later this winter. It is important to note that all weather roads and well developed infrastructure serving this region will enable exploration work to be completed year round. Therefore, the Company will have the opportunity to continue with its planned activity immediately upon the review of the geophysical surveys, and will not have to incur any delays pending the return of spring conditions as is common in more remote gold districts. Among the roster of active exploration properties held by Globex, the Bräunsdorf project located in Saxony, Germany is also slated to undergo geophysical programs to collect additional data that will be of much value. 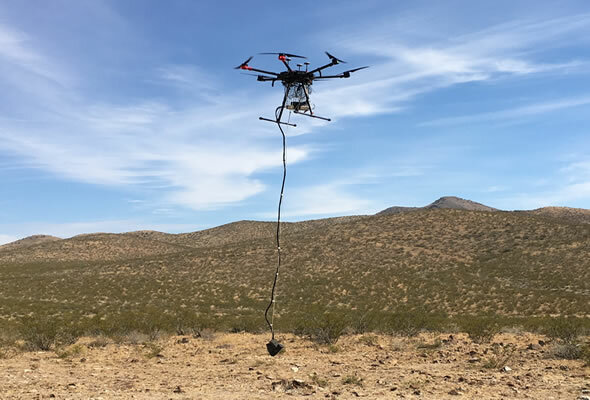 The Company reported that a ground magnetometer survey has started and that a drone magnetometer survey on the property area is pending with the confirmation of favorable weather in the days ahead. In addition, an IP survey is planned that will commence in mid-February if the weather conditions allow. Various levels of fieldwork have been underway at Bräunsdorf since 2017. The upcoming geophysical programs will be completed on both new and historic exploration targets. In one day, a technical operator can walk roughly 10-15 line kilometers of a ground magnetometer survey. 100 line kilometres is equivalent to 10 days of operator time and expenses whereas an Unmanned Airborne Vehicle (UAV) magnetometer system can collect high quality data from the same distance in a single day. As with the geophysical surveying launched at Francoeur/Arntfield, the collection of geological data for the Bräunsdorf project is an indication of the commitment to advance systematic and efficient exploration work that improves the outlook for a successful outcome when the subsequent drilling work gets underway later in the year. Investors’ attraction for mineral exploration companies is driven by the potential for spectacular gains that are often generated with the achievement of significant discoveries. One of the most important considerations regarding junior explorers therefore is the determination to carry out exploration programs and continue towards the achievement of at least one defined resource deposit. The most successful junior explorers have demonstrated the ability to carry out early stage fieldwork programs that can improve the overall odds for success, prior to embarking on the more expensive drilling work later in the process. As the geophysical surveying techniques have advanced in recent years these programs have become a valuable tool to generate high profile drill targets. Similarly, the skills of the management team to select the most attractive districts for exploration activity and then strategic acquisitions to secure the ownership of significant property holdings establishes the foundation for a successful discovery program. Globex has built a suite of diversified property holdings with leverage in many districts at the forefront of mineral exploration. The combined approach to focus its efforts in the most attractive areas and follow through with ambitious work activity has led to resource expansion at several of the prospects held by the Company. This has then contributed to shareholder value. Even with the calendar only a few days into the new year, Globex has continued its commitment to aggressive exploration work at its most prospective projects in Quebec and Germany. This approach will generate news flow and perhaps generate additional defined resource leverage for these projects, leading to greater appeal for the shares of the Company. Smallcaps Recommendation: BUY.